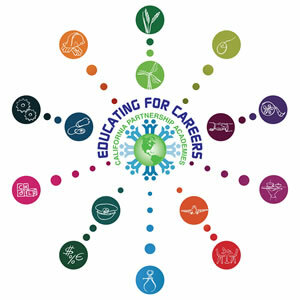 The 2017 Educating for Careers Conference: Student Success through CTE (EFC) conference committee announces several exciting changes to the conference schedule format. EFC will go paperless this year! The conference program will be available for download from the website and/or through the conference mobile app. There will be no printed version in 2017. Sunday will open with 90 minute interactive Intensive Seminars. The afternoon round of Intensive Seminars will be 120 minutes to allow for such sessions as the California Partnership Academy Round Tables and funding specific meetings. The opening general session with Keynote Josh Davies is scheduled for Sunday, 3:30 pm. The final changes will occur on Tuesday with breakout session I occurring prior to the final general session and Keynote Dr. Adolph Brown. Please check the conference schedule carefully. This new structure will allow for increased choice within each strand of the conference. Each year a variety of delivery systems, strategies, and Industry Sectors throughout California’s CTE system are represented in the more than 240 breakout sessions offered over the course of this three-day conference and this year will be even more exciting with the format changes. Career and College Readiness has been a theme throughout California for several years, however the past few years have brought renewed strength in Career Technical Education (CTE). The continual overarching goal of this conference is to offer high-quality, cost-effective professional development for all stakeholders with broad general breakout session themes such as: Assessment & Accountability; California Partnership Academies Model; Career Pathways/Industry Sectors; Curriculum & Instructional Strategies; Employer & Community Partnerships; Mentor & Internship Programs; Middle School Connections; Perkins Policy & Programs; Secondary-Postsecondary Connections; and Work-Based Learning. The Administrative Strand will continue once again in 2017. There is something for every educator involved in a CTE program – no matter the delivery strategy.